3 bedroom villa in villas development - Property for sale. 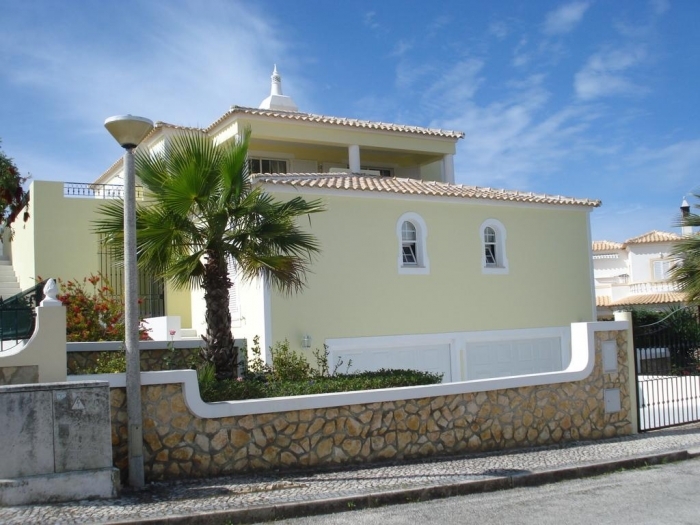 Full Description: This 3 bedroom villa is located in a quiet cul-de-sac in Vale Santa Maria just outside of Albufeira. This is a perfect location for permanent residence or peaceful holidays. All amenities are close by and the main resort of Albufeira, the small town of Guia, famed for it's Chicken Piri Piri restaurants and the Algarve Shopping Centre are just a short drive away. This is a deceptively large villa with plenty of windows giving lots of natural light and quality fixtures and fittings throughout. Accommodation consists of, entrance from the top terrace leads into the utility room with sink and a door to a spacious storage cupboard, the kitchen is fully equipped with Ariston appliances, a seperate dual aspect dining room and balcony with countryside views, spacious dual aspect lounge with woodburner, large window that leads to a balcony with far reaching country views, a door leads to a large hallway with door that leads outside to the pool area, guest w/c and stairs leading down to the three large bedrooms. The first bedroom has fitted wardrobes, tiled floor, en-suite shower room, wc, sink and walk in shower, along this large hallway is bedroom two, fitted wardrobes en suite bathroom with wc, bidet, sink and corner bath, bedroom three consists of fitted wardrobes and ensuite bathroom, wc, sink, bidet and bath. Off this hallway is a large door which leads to the external stairs, leading up to the pool or down to the double garage, internally there are stairs that lead to the large double garage with electric water boilers. Upstairs off the landing is a large sun terrace and private swimming pool with lovely countryside views. The villa has many extras including aluminium shutters, double glazing, air conditioning and Sky TV. The rooms have all been tastefully decorated. Outside the plot is fully walled and enclosed, entry is through remote gates, there are mature trees and flowering shrubs. There is a built in bbq on the top terrace which is right next to the pool and sun terrace, perfect for relaxing and al-fresco dining. This is a very spacious and very light villa perfect for a family home. Viewing is highly recommended.